Synopsis: The trees swallowed her brother whole. And Jenny was there to see it. Years later, when she returns to the woods where Tom was taken to say good-bye at last, she finds herself lured into a world where stunning beauty masks the most treacherous of evils, and strange and dangerous creatures await—creatures who seem to consider her the threat. Among them is Jack, mercurial and magnetic, with allegiances that shift as much as his moods. Determined to find her brother, with or without Jack’s help, Jenny struggles to navigate a faerie world where nothing is what it seems, no one is who they say, and she’s faced with a choice between salvation or sacrifice—and not just her own. I've seen this book around the past couple of weeks and every time I see it, I get more excited to read it...and then I remember it's not coming out till NEXT AUGUST and I groan. It sounds fascinating, and if you've been to my blog regularly, you'll know I'm all about faeries. Plus, that cover is one of the most gorgeous covers I've ever seen! What are you currently reading? Right now, I'm reading a hard copy book and an ebook. The hard copy is What Happened to Goodbye by Sarah Dessen. Sarah Dessen - need I say more? The ebook is Flame of Surrender by Rhiannon Paille. I haven't had time to read it since last week and I feel really bad because the release date was yesterday, I believe, but I'm going to try to get back to it today. What did you recently finish reading? I recently finished Some Girls Bite by Chloe Neill, Claire de Lune by Christine Johnson, and 13 on Halloween by Laura A.H. Elliot. Great pick! I love the sounds of it and the cover is pretty! A very interesting read, and a very beautiful cover. On one hand, I don't know how I missed this until now, and on the other, ACK AUGUST! This looks so so interesting and good and a faery-sorta-shifty-person named Jack? Perfect. Your WoW pick looks stunning. I'm pretty sure it's on my TBR. But yeah it's FOREVER away! I've been seeing this a lot of people's WOW shelf. Great WOW choice. 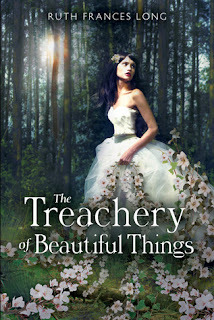 The treachery of beautiful things sounds great and that cover is beautiful!